Silver Hand Warriors are deceased Nord bandits and members of the Silver Hand. Three can be found in Whiterun, just outside the Companions headquarters Jorrvaskr at the conclusion of the quest Blood's Honor. Another Silver Hand Warrior can be found inside Dustman's Cairn. They all wear a randomly determined set of light armor; at all levels, there is always a 50% chance they will wear fur shoes, and a set of fur armor, while the other 50% can differ for both shoes and armor; at level 1-5 it can be hide boots and/or hide armor, at level 6-18, it can be leather boots and/or leather armor, and at level 19-28 it can be scaled boots and/or scaled armor or scaled horn armor. Additionally, they have a 50% chance of wearing a set of leveled gauntlets, again randomly determined; it can always be fur bracers but, at level 1-5, there is a 50% chance it can be hide bracers, at level 6-18 it can be leather bracers and at level 19, it can be scaled bracers. Lastly, there is a 20% chance of them carrying a leveled shield, up to elven quality at level 12. They carry one randomly determined weapon; either a silver sword, a silver greatsword or a leveled mace, sword or war axe (up to elven quality at level 20). They also carry some random loot such as ingredients, beverages, potions or ingots and a small amount of gold. Two male Silver Hand Warriors lie on both sides of the stairway leading to Jorrvaskr; the one to the north was defeated by Torvar while the one to the south was killed by Aela the Huntress. 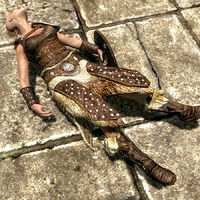 There are two female Silver Hand Warriors; one can be found in the middle of the stairway leading to Jorrvaskr. 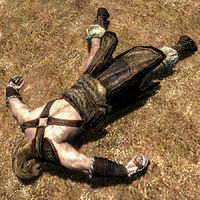 She was killed by Aela the Huntress. The other can be found inside Dustman's Cairn, on a closed sarcophagus in the northeastern chamber. This page was last modified on 27 January 2016, at 20:38.